Don’t be isolated – join a local group to meet new people and share your interests. And don’t be afraid to contact one of the big Scottish or UK mental health agencies if you need some info. AdvoCard is a service user-led, independent advocacy organisation in Edinburgh. It provides both individual and collective advocacy for people with experience of mental health issues with the aim of providing opportunities for people to participate more effectively in decisions that affect all aspects of their lives. As an organization, AdvoCard is commited to equality, inclusion and human rights. Bipolar Scotland provides support and information to everyone in Scotland who lives with Bipolar Disorder (Including friends, family and carers). We support self-management and inform and educate about the condition. Psychiatric Rights Scotland campaigns for human rights in psychiatric settings. They are particularly concerned about the over-use of anti-psychotic medication and the lack of safeguards in the Mental Health Act. User and Carer Involvement is a Scottish charity operating across Dumfries and Galloway. Its mission is to provide a representative voice for people who have mental illness, dementia or learning disabilities and their families and carers and as a result, ensure positive changes in service provision. We achieve this through consulting with groups and individuals to provide collective advocacy and also can provide one to one advocacy. PlatForum provides a forum for people with mental health issues to have their say on how services are run. It tackles stigma and raises awareness. It provides a safe and welcoming space for anyone affected by mental illness. SAMH (Scottish Association for Mental Health) is one of Scotland’s leading mental health charities. The Association works hard every day to ensure that people are talking about mental health and does this in four ways (i) community based services for people with mental health problems (ii) national programmes (iii) policy and campaigning work, and (iv) raising funds to ensure that our vital work can continue. Scottish Mental Health Arts and Film Festival is one of Scotland’s most diverse cultural events, covering everything from music, film and visual art to theatre, dance, and literature. The annual festival takes place in venues across Scotland during October, aiming to support the arts and challenge preconceived ideas about mental health. Scottish Recovery Network (SRN) is a non-profit initiative working in Scotland and beyond. SRN’s vision is: A Scotland where mental health recovery is a reality for all. Their aim is to promote and support recovery from mental health problems. They act as a catalyst for change by sharing ideas and practice. Unity is strength! If you feel lonely and would like to join one of Scotland’s many mental health groups, please type in your postcode or use the map below to locate your nearest group. 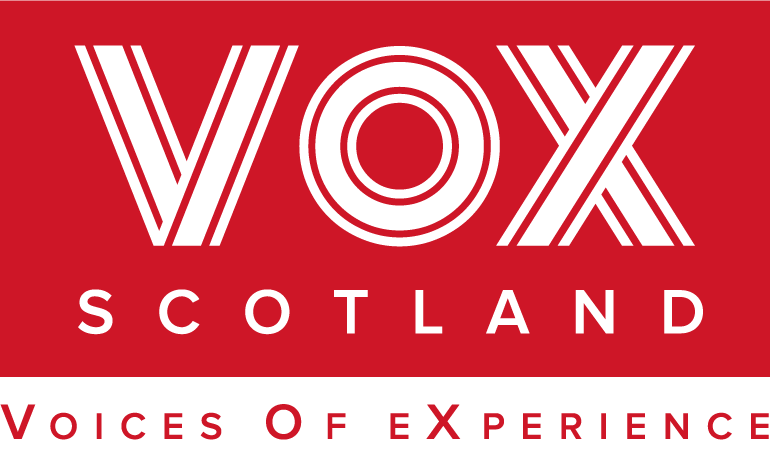 We encourage all VOX members to think about joining their local mental health group – it’s a great way to meet new friends, learn about services, exchange useful information and combat feelings of isolation. Most groups have a strong social side so joining is a great way to meet new people, access keep-fit classes or even learn a new hobby. Membership is usually free and costs are usually quite low.